Amblyopia, also known as lazy eye, is a vision development disorder in which an eye fails to achieve normal visual acuity, even with prescription glasses or contact lenses. Amblyopia begins during infancy and early childhood. In most cases, only one eye is affected. But in some cases, reduced visual acuity can occur in both eyes. Particularly if lazy eye is detected early in life and promptly treated, reduced vision can be avoided. But if left untreated, lazy eye can cause severe visual disability in the affected eye, including legal blindness. A lot of misled about lazy eye, just because one side eye has a difference in power. It does not justify for classification of a lazy eye if both eyes can achieve similar visual acuity with the aid of glasses or contact lenses. If somebody has classified your child as lazy eyed, please drop by at Malaya Optical in Damansara Uptown for our Optometrist to double check and ensure that your child is/not Amblyopia/Lazy Eye. Because amblyopia typically is a problem of infant vision development, symptoms of the condition can be difficult to discern. However, a common cause of amblyopia is strabismus. So if you notice your baby or young child has crossed eyes or some other apparent eye misalignment, schedule an appointment for a children’s eye exam immediately — preferably with an optometrist or ophthalmologist who specializes in children’s vision. Another clue that your child may have amblyopia is if he or she cries or fusses when you cover one eye. This may suggest that the eye you have covered is the “good” eye, and that the uncovered eye is amblyopic, causing blurred vision. Strabismus is the most common cause of amblyopia. To avoid double vision caused by poorly aligned eyes, the brain ignores the visual input from the misaligned eye, leading to amblyopia in that eye (the “lazy eye”). This type of amblyopia is called strabismic amblyopia.Sometimes, amblyopia is caused by unequal refractive errors in the two eyes, despite perfect eye alignment. For example, one eye may have significant uncorrected nearsightedness or farsightedness, while the other eye does not. Or one eye may have significant astigmatism and the other eye does not. In such cases, the brain relies on the eye that has less uncorrected refractive error and “tunes out” the blurred vision from the other eye, causing amblyopia in that eye from disuse. This type of amblyopia is called refractive amblyopia (or anisometropic amblyopia). In some cases of refractive amblyopia, normal vision can be achieved simply by fully correcting the refractive errors in both eyes with glasses or contact lenses. Usually, however, at least some patching of the “good” eye is needed to force the brain to pay attention to the visual input from the amblyopic eye and enable normal vision development to occur in that eye.Treatment of strabismic amblyopia often involves strabismus surgery to straighten the eyes, followed by eye patching and often some form of vision therapy (also called orthoptics) to help both eyes work together equally as a team.Patching may be required for several hours each day or even all day long and may continue for weeks or months. 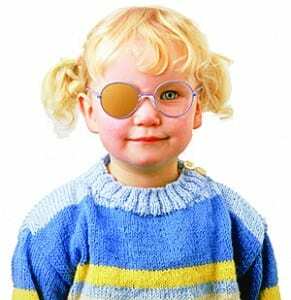 In some children, atropine eye drops have been used to treat amblyopia instead of an eye patch. One drop is placed in your child’s good eye each day (your eye doctor will instruct you). Atropine blurs vision in the good eye, which forces your child to use the eye with amblyopia more, to strengthen it. One advantage of using atropine eye drops is that it doesn’t require your constant vigilance to make sure your child wears the patch. In one large study of 419 children younger than 7 years of age with amblyopia ranging from 20/40 to 20/100 prior to treatment, atropine therapy produced comparable results to eye patching (though improvement in visual acuity in the amblyopic eye was slightly greater in the patching group). As a result, some previously skeptical eye care practitioners are using atropine as their first choice for amblyopia treatment over patching. However, atropine does have side effects that should be considered: light sensitivity (because the eye is constantly dilated), flushing and possible paralysis of the ciliary muscle after long-term atropine use, which could affect the eye’s accommodation, or ability to change focus. 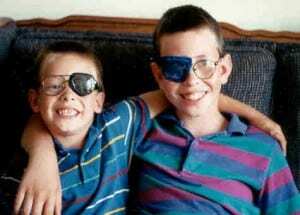 For years, experts believed that if amblyopia treatment was not initiated very early in life, no improvement in visual acuity was possible. The critical period for intervention was said to be around age 8. Amblyopia will not go away on its own, and untreated lazy eye can lead to permanent visual problems and poor depth perception. If later in life your child’s stronger eye develops disease or is injured, he or she will depend on the poor vision of the amblyopic eye, so it is best to treat amblyopia early on.